Sina, China’s largest internet portal and media website, launched a channel for infographics this week. Its main mission is visualizing news, as claimed on its official weibo (microblog) introduction. Sina is already the late comer. 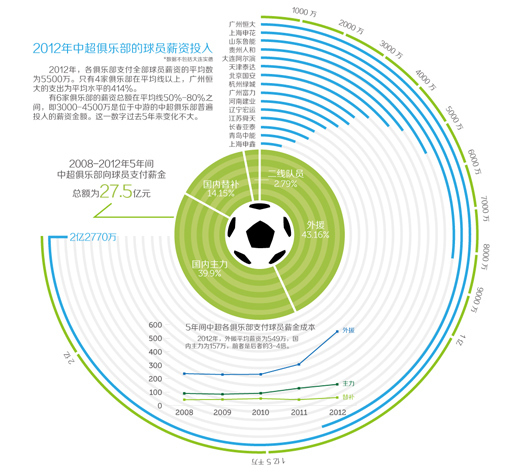 In the past year, infographics has been booming in China. Magazines and newspapers are building more graphics, blogs are translating English-language infographics to Chinese and some produce their own original works too, and social networking sites are playing a big role in spreading the good pieces. I had the advantage to witness a newspaper’s attempt in this field. The paper, Southern Metropolis Daily (南方都市报), a daily newspaper distributed largely in the Pearl River Delta area, experimented an infographics section on its print version in late May. They call the new section “stories in numbers” and it is on the city news page. The story dated back to December of last year. At that time I was invited to the Sun Yat-sen University in Guangdong province to deliver a lecture of data visualization to a class of journalism graduate students. Also attended the class was a group of web and multi-media editors from Southern Metropolis Daily. They participated actively in the lecture and on-class assignment. In mid May this year, I was invited by Southern Metropolis Daily to offer a training with the same topic to a broader audience within their paper. To my surprise, they showed me a handful of infographics that they produced since the end of last year. The infographics are only displayed on their website but not in print. They’ve tried various topics, from North Korea satellite launch to the life of an online part-timer in China, from South China Sea dispute to urban development in Guangdong. They are mainly newsy but independent as it should be. Some of them are still quite text-heavy, and the styles are not really consistent. Upon request of critics, I gave some general comments like less words, more comparison, simplicity is the key, etc. Lately, they’ve produced a series of infographics on the national college entrance examination, which is another good try. Then the surprised followed as two weeks after my training, they started the “stories in numbers” section, this time in print. To be honest, the work in print is more of a very primary way of newspaper graphics design, with more illustration of the numbers. And I don’t see it appearing regularly, but I would hope they keep trying. It’s great to see that the practitioners are taking what you lectured to heart and keep producing works. iSun Affairs is an interactive iPad magazine on Chinese current affairs. It provides in-depth investigations and insightful commentaries on Chinese politics, economy, society, literature, and international affairs. The magazine is in Chinese, but unfortunately and not surprisingly is blocked on mainland. Their infographics are very newsy, editorial driven, and covers greater China with a strong focus on Hong Kong, where majority of their editorial team is based. Topics are like Chinese tax, Hong Kong capitals, Hong Kong vs. Wukan etc. Being blocked in China, and on weibo platforms, they rely on Google+, Facebook and Twitter for infographics circulation. But when their works got picked by other media, they got viral. For example, the one comparing the living cost of mainland vs. Hong Kong was posted by the official weibo of New Weekly (Xin Zhou Kan) and Vista (Kan Tian Xia), two major magazines in China, and got 1500+ retweets combined and more than 300 comments. It is an independent group blog committed to introducing academic studies on China politics to the Chinese public. Infographics is its most well-received way of turning sophisticated academic reports and complex political concepts into plain language for Chinese audience from all backgrounds. Their first attempt was on a conceptual topic: left vs. right in China. It was published in late February this year and went viral. Its main weibo post got forwarded (same as retweet) more than 14,000 times and received more than 2000 comments. It was updated a few times based on comments and was later translated to English. Their infographics are always about China’s politics (they do self-censor, for sure) and social affairs. So far they’ve covered National People’s Congress, Chinese government work report, Hong Kong election, central government budget, and minority ethnics in China. The production is also very editorial-driven. People behind this blog are all in their 20s, some in academia and some in media. It is a virtual and global team, and everyone are volunteers including the designers. The very strong academic background of the group made their infographic very much fact-based with clear but cautious conclusions. Launched in January this year, it started with basic charts and raw graphics designs, but producing more and more neat and professional infographics recently. They have two editors/ designers working on the blog, who produce three works per week on average. Unlike iSun Affairs and CNPolitics that produce heavily researched works with clear social concerns, Netease is lighter in both content and design. Their topics include public toilets in Beijing, movie ticket price in China, urbanization, death penalty, safe flight must-know, Baidu encyclopedia vs. Wikipedia, transparency of American official’s assets, etc. Some of them are news-related, but most of them are not. Their daily-life-oriented editorial judgement brings them pretty good reader participation: comments under each piece varies from 2000 to 50,000. One prove to their success is their daily pageview of 100,000, with heated pieced attracting more than 450,000 pageviews, according to a blog post. Beyond these pioneering media organizations and websites that are taking the lead, there is a huge community growing behind, both on the editorial and designing end. Huaban: this is a Pinterest-like photo/graphics sharing site, where lots of infographics works get collected and shared. I tried typing infographics as the keyword for in-site search and it turns me 400+ boards and 7000+ collections. Douban: it is a social site for sharing books, films, music and events. There are at least three groups on infographics, number of members varies from a few hundreds to 1500+. People share books and events on the topic. Guokr: it is a social site focusing on science and technology, and there is a group with more than 5000 members discussing infographics. Topics here are more on the design end like tools and softwares. Renren: the Chinese equivalent to Facebook, with its user base heavily on university students. It has an infographics group with 3000+ members. Google Groups: beside the open and public groups mentioned above, some smaller discussion groups are there, mainly for specific projects and blogs. The ones I’m involved are all using Google Groups. Besides online groups, offline events and gatherings are taking place as well. Trainings and workshops are starting, which would help shape the niche discipline to be more professional. The next thing I would expect is the interactiveness, which hopefully won’t take too long.